A couple of weeks ago on my blog, I shared that I was going to post the entire first MetaWars book, in serial format, onto wattpad. If you don’t know wattpad (and I’ve been surprised at how many people over the age of 20 don’t) it’s basically a global storytelling platform: think YouTube for writing. In it’s first ten days, MetaWars garnered about 1,000 reads. I was pretty impressed. Getting a thousand new readers in today’s book-selling industry is no easy feet. This was organic discovery. Fellow readers (and writers) found MetaWars based on its tags (science fiction, teen, action, etc) and via other users’ votes and comments. A thousand new readers; not bad. So far, so groovy. Better still, I dived deeper into the wattpad community and discovered, first hand, an expressive, supportive network of interconnected creative people. Wattpadders are the kind of people you always wished you’d find in high school, but usually never did. But online, globally, they are finding each other with no geographic boundaries. I started reading short stories and serialised fiction from people around the world. I haven’t yet delved into fan-fiction (one of wattpad’s leading leading genres), but must geekily admit I’m tempted to mount a Twin Peaks fanfic. On June 20th, as I was making a five-hour drive to a wedding in the cottage country north of Toronto, MetaWars was selected as a featured read. When I finally found wifi in the woods a few days later, the whole thing had gone exponential. In the past two weeks (June 20-July 3), MetaWars has garnered over 82,000 reads! Now, to be fully accurate, many of those reads (like youtube “views”) will be curious lookie-loos who click on the featured book only to quickly decide they don’t really want a sci-fi thriller or a teen-targeted book, and move swiftly on. But many are sticking with the novel and feeding back some fantastic comments. For a writer who spends most of my time alone in the writer’s cave, to get real time feedback from readers enjoying my work is an amazing, game-changing experience. I first heard about wattpad from Margaret Atwood at a reception at the Canadian High Commission a few years ago, and to be honest, was so busy writing the MetaWars series that I didn’t grant myself time to play in the sandbox. It wasn’t until I was sharing the iterative writing process (I’ve been having fun using the Pixar model of creative development) on an upcoming book (Alienated: Ground at Groom Lake) that Ashleigh Gardner from wattpad reached out and suggested I try writing socially on wattpad that I took a serious look. I approached my publisher, Orchard Books (part of the Hachette family) with the idea of putting the first of the four MetaWars books on wattpad to build the fan base for the series. Since MetaWars is published around the world, but not yet in the U.S., it felt like a sensible experiment to get the story in front of more readers. I must give Orchard & Hachette credit for being willing to experiment with me. It would’ve been easy for them to say no, and I certainly wasn’t going to do it without their blessing; but since we’ll all living through the digital transformation together, I’m glad to have the publisher onside for the learning. A good question from an incisive mind. I was pleasantly surprised to discover that I’m not the only published author on the platform. Obviously, Ms. Atwood is a contributor (she’s apparently an early investor) and another fellow Canadian, Cory Doctorow, has his works on the platform. Sci-fi and YA author Scott Westerfeld is currently serialising his Uglies novel. And this is all great news for readers. I spend a lot time in schools, talking to reader and hoping to inspire reluctant readers, and while I hear a refrain from adults that “kids don’t read any more” I’m excited to share that kids (tweens/teens) do read, but they are reading differently. 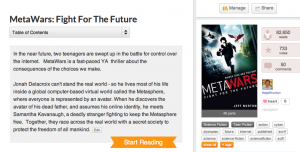 On wattpad their reading is social and mobile, and the reading experience invites users to become active participants in the creative process…reading begets writing. My hypothesis is that wattpad will quickly emerge as the Sundance Film Festival of writing; the launching platform for new talent and the creative sandbox for established authors to flex their creative muscles in parallel with their major publishing contracts. Last week in Toronto, the wattpad team celebrated the grand opening of their cool new office space, and I think readers of the world should raise their mobile phones and toast their success. Just joined as a writer on Wattpad myself, and frankly I am enjoying it more as a reader! I’ve forced myself to look at writing and publishing in new ways, and am really enjoying the social aspect of it. You’re right – kids do read, and kids are clearly writing as well, which is fantastic. I see it not just as paperback 2.0, but a new opportunity for young people to write creatively and get feedback.